Oh, Calgary. Embracing the snow today? Don’t worry – it won’t last too long, and we will still be enjoying lovely fall weather! 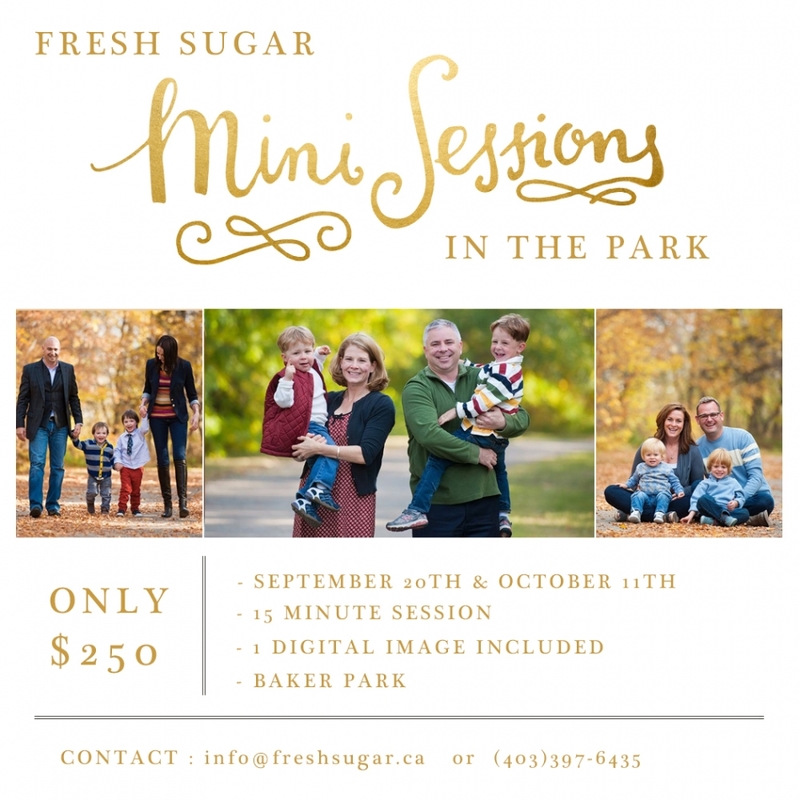 Mini sessions in Baker Park are back by popular demand! It’s been a couple of years and I know that many of you are excited about that leafy goodness only a park in autumn can provide! There are two dates – September 20th (better for green leaves) and October 11th (better for golden leaves). Price is $250 and includes one digital image perfect for printing copies yourself or ordering holiday cards! New this year – a $1200 pre-paid option. An overwhelming majority of clients end up purchasing the digital images from their mini session (they are an amazing deal of over 60% off the regular price) and this year, to make it even sweeter, pre-purchase the digitals and get the session for free! Both the session and digital images for only $1200! As always, previous clients and newsletter subscribers got first crack at booking – so spots are limited! Email info@freshsugar.ca to claim your spot on your preferred date!